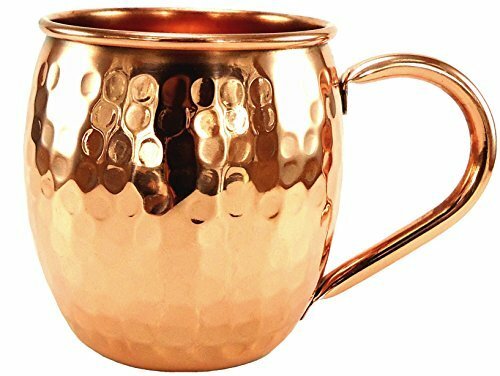 AUTHENTIC MOSCOW MULE: Akaiger copper mug is made of 100% solid copper enhancing the taste of your drink and giving you a unique drinking experience with that extra cool sensation (ICY COLD!). DEFINITELY SAFE FOR DRINKING! Akaiger copper mug has no inner linings such as Tin, Nickel, Steel, or other metals which will have a noticeably gross smell or taste. It has food-safe lacquer coating outside which helps preserve beauty and luster. Note that this mug is not for hot and highly acidic drinks as these can accelerate copper leakage. And that is why you should drink a hot drink on a ceramic mug, an acidic drink on a glass mug, and reserve your cold drink on your copper mug. PARTY WITH STYLE: Akaiger copper mug is definitely perfect to host your awesome Moscow Mule cocktail party. With our classic and traditional 16-oz copper mug, your guests will have a taste of the perfect and amazing experience of the Moscow Mule Heritage! No need to go to high-end bars or pubs to experience one. EASY TO CLEAN! You simply rinse the copper mug with warm, soapy water and dry it immediately. Note that this is for hand wash only; DO NOT use dishwasher. ORDER WITH CONFIDENCE: We stand behind our brand with 100% High Quality Guaranteed! If you have any issues with your product, feel free to return it and we offer you full refund.